Terror in a Texas Town (1958) is a peculiar Western, so peculiar, in fact, that even its admirers often can't adequately explain what makes it so effective. Some are drawn to the unusualness of its hero, a Swedish whaler (Sterling Hayden), who in the film's climax uses a harpoon as a weapon. Others insist what makes Terror in a Texas Town is the direction of cult filmmaker Joseph H. Lewis, whose last feature this was. Still others point to the script, credited to Ben Perry, but who was actually a front for blacklisted writer Dalton Trumbo (and similarly blacklisted Howard Lawson and Mitch Lindeman, apparently uncredited co-writers). All of these factors contribute to the movie's uniqueness somewhat, but a great deal of the movie's appeal appears to have been accidental. It was a low-budget production, probably made for around $125,00-$150,000 (the TCM Database reports 10 shooting days and an $80,000 cost, which seems a trifle low), and the threadbare production values work for and against it. Terror in a Texas Town uses what is certainly the most overworked plot of low-budget Westerns: rich land baron ("brain heavy" in genre-speak) hires a gunfighter ("dog heavy") to force poor settlers off their land so that he can lay claim to riches (oil in this case) they don't realize is under their feet. In such films the hero rides into town only to discover that his best friend or relative has been murdered by the dog heavy on the brain heavy's orders, unravels the mystery and faces off with the heavies at the climax. This film is not, as many have suggested, a low-budget High Noon as much as it resembles dozens upon dozens of other cheap late-‘50s Westerns, many of which starred Sterling Hayden, but here tweaked ever so slightly by director Lewis or in the writing or in Hayden's performance, or which comes off as slightly weird because of the low budget. 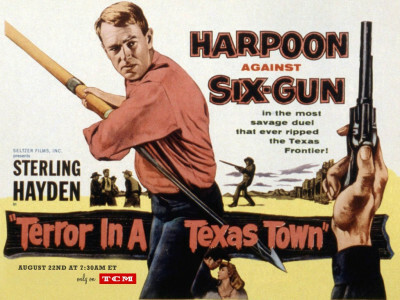 In the movie, the hero is George Hansen (Hayden), Swedish whaler who arrives at Prairie City to work the land with his father (Ted Stanhope), unaware that hired gun Crale (Nedrick Young) has already murdered him, on orders from corpulent saloon owner McNeil (Sebastian Cabot). Poor farmer Miranda (Victor Millan of Touch of Evil) and his son, Pepe (Eugene Mazzola), witnessed the shooting and Miranda has even figured out about the oil beneath his property but is too terrified of Crale to inform Hansen. Hansen, meanwhile, forthright and determined to the point of being blundering, abjectly refuses McNeil and Crale's unsubtle hints for him to leave town. Terror in a Texas Town's qualities are so slight as to easily be overlooked. I was a bit surprised by colleague DVD Savant's lukewarm review. Each of us has seen dozens of other cheap Westerns from this period yet for me the film has a strange quality that, for the most part, is beguiling. Outwardly, Sterling Hayden seems miscast. He doesn't really attempt much in the way of a Swedish accent and his flat way of speaking and reticent screen persona would seem to work against the character. But he's also appropriately tall, blonde, and strapping, and in real life a sailor, adding verisimilitude. On big screens one can just barely perceive the shock and sadness he tries to hold back upon learning of his father's murder. He's fascinating to watch as McNeil initially thinks Hansen is a dumb foreigner easily dispensed with, and Hansen's gradual awareness of McNeil's crookedness is subtly played. Savant unfavorably compares Nedrick Young's Crale to Jack Palance in Shane, the iconic ‘50s Western heavy. But where Palance's character in that film, Jack Wilson, was a personification of sadistic evil, Crale is much more complex. My take is that Crale is menacing in a Wilson sort of way only because he's good at it, not because he takes pleasure in taunting and murdering innocents as Palance's character does. In Crale's case it's a job that he does well and he seems to figure he's incapable of doing anything else. Evidence of this is the way he matter-of-factly informs Hansen of his father's murder in McNeil's saloon. He's neither being sadistic, nor does he express any guilt about having murdered the man, but there's a hint of empathy toward Hansen's personal loss. More evidence is Crale's over-emphatic dog heavy attire, an all black, tight-fitting costume that's mildly exaggerated for the period in which the movie was made. That Nedrick Young himself was a small man - dwarfed by 6'5" Hayden and even his alcoholic girlfriend (Carol Kelly) is half-an-inch taller than he is - further suggests and actor playing a role. Moreover, his psychological unraveling near the end is the direct result of a victim refusing to properly "play" his "role" in the story. Young, like Trumbo, was blacklisted. Unusually, he worked as both an actor and a screenwriter, his greatest successes being two films he wrote for Stanley Kramer (The Defiant Ones and Inherit the Wind) and one for John Frankenheimer (The Train), none of which he was initially credited. Savant argues the cast of Terror in a Texas Town give rather disengaged performances, but in Young's case I take it as world-weariness, and in Hayden's a quiet determination to take what's rightly his. It would probably be a stretch to suggest that the weight the ‘50s witch hunt had on Young and Hayden is visible in their performances but the cumulative toll is plainly on their faces. The low budget damages the movie in some ways and inadvertently helps it in others. Gerald Fried's musical score is mostly terrible and absurdly undernourished; the orchestrations are mostly limited to three instruments - a guitar, a trumpet, and a set of drums. The film opens with a strange flash-forward of the climatic showdown between Hansen and Crale, pretty much ruining the surprise of Hansen using only a whaler's harpoon, and the credits play over other randomly selected highlights. This may have been an effort to bring the movie's running time to 80 minutes to please distributor United Artists. DVD Savant notes the western streets bereft of people, but while this was a undoubtedly a budget-driven decision I think it works to the film's favor. He likewise criticizes the positioning townsfolk within Crale's line of fire as sloppy staging, but that seems deliberate, Prairie City's citizens taking a stand against Crale when they should be cowering behind doors and windows. Licensed from MGM, Terror in a Texas Town is presented in 1.85:1 widescreen and black-and-white. The transfer is good but the cheapness of the film can't hide its TV-level visuals. The LPCM 2.0 mono is fine and English subtitles support the disc. Supplements include both an introduction and "visual analysis" by Peter Stanfield, who like many others struggles to peg the film's praiseworthy aspects while acknowledging its shortcomings in other areas. A trailer is also included. Subtly unusual, Terror in a Texas Town is very worthwhile but it's best to watch the film with no expectations going in. It's the kind of picture that if one stumbles upon it late one sleepless night has the capacity to really dazzle the viewer, even if one can't explain why by morning. Highly Recommended.